Commercial Fire Prevention: How Comprehensive is Your Plan? Commercial fire prevention plans are necessary, and it doesn’t matter what type of business you own or operate. Fire prevention is no joke. Commercial fire prevention plans are necessary, and it doesn’t matter what type of business you own or operate. But when was the last time you held a fire drill? And just how comprehensive is your plan? Before any fires break out in your building, it might be worth it to evaluate your current fire prevention protocols. Do You Avoid Fire Hazards? Avoiding fire hazards is no laughing matter. 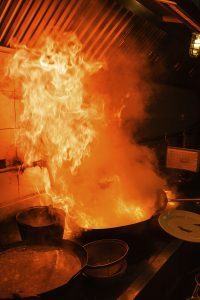 If your business is a restaurant or a manufacturer, you will have much higher chances of a fire hazard starting a fire than if your company is part of the private sector. Even so, it’s rare for any business to have zero fire hazards. The first step in designing a robust commercial fire prevention plan is to make sure any and all fire hazards are appropriately accounted for and inspected. What Protocols Do You Have? Schools, hospitals, colleges, and movie theaters all need to have escape plans in case of fire. Businesses are no exception; they all need to have an idea of what to do in case of a fire. What protocols are part of your commercial fire prevention plan? Creating a plan for orderly evacuation isn’t enough, you need to be able to test its effectiveness. It also wouldn’t hurt to give all of your employees some basic training on how to use a fire extinguisher, and when they should use it. Do You Arrange Timely Inspections? Just as you would have inspections for your vital equipment every few months, you should have your fire protection assets examined as well. Nobody likes it when the printer jams or the heat suddenly stops working when it is negative ten degrees outside. But it gets even worse when a fire happens, and none of the extinguishers are charged, or the fire sprinklers don’t activate as they should. Avoid this worst case scenario by making sure all of your fire protection and prevention measures work. We understand that you might not know how to test all of it, which is where the experts from Judd Fire Protection can step in for you. If you want to ensure your home and business are safe throughout the year, trust Judd Fire Protection, LLC. We have over two decades of experience with design, installation, service, and inspection of residential and commercial fire protection systems. We service clients throughout the Maryland, Pennsylvania, Washington, D.C., Virginia, and West Virginia. If you are interested in finding out more about our services and protecting your home and business, give us a call at 410-871-3480 or contact us online. For more fire safety tips, follow us on Facebook, Twitter, and Pinterest. This entry was posted on Friday, January 19th, 2018 at 12:04 pm. Both comments and pings are currently closed.